I played soccer since I was 8. In 1996 I had to give after a bad broken ankle (is there a good broken ankle?). I met a referee (Peter Bloy) and decided I would try it myself. I started in 1999. 2000 I was awarded the J.E. Jones Memorial Trophy for most improved referee not a New Zealand Badge Holder. 2001 I was awarded the I. Billcliff cup for most improved referee awarded their New Zealand Badge in the previous two years. 2002 I was awarded the L.J. Holland Memorial Cup for the most improved New Zealand Badge Holder. 2003 I was awarded the CSRA Trophy for Assistant Referee of the year. I won the CSRA Quiz trophy in 2004. I have been CSRA Secretary since 2003, and was awarded its Administrator of the Year trophy in 2005. I was appointed to the Assistant Referee panel of the National League in 2002 and 2003, and of the New Zealand Football Championship in 2004/05 and 2005/06. Initially I saw refereeing as second-best to playing, but I now wish I had made the switch at a younger age. Refereeing involves many of the same skills of fitness, anticipation and positioning that playing the game requires, and a good refereeing performance is very satisfying. The highlight of my playing career occurred when I saved a penalty as a nine-year-old to win a game against the top team in our group; everything was pretty much down hill after that. 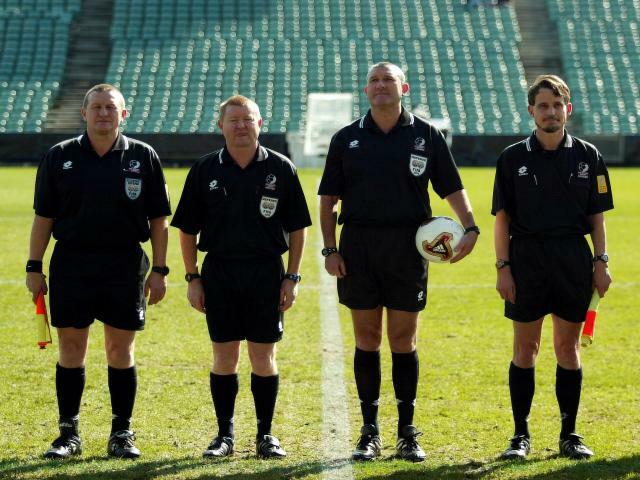 The highlight of my refereeing career was joining Wayne Stapley as the Assistant Referees for the 2003 Chatham Cup final at North Harbour Stadium.